The Inverter premiered in 1998 by Chance Rides in partnership with A.R.M Rides Ohio plant. A.R.M built the main structure and Chance, the passenger vehicle. At the time of Inverter’s debut, it sold for around USD$500,000. Standing 48ft tall, Inverter’s structure consists of a counterweighted arm bearing a 24 person gondola with riders seated in six rows of four. As the arm rotates back and fourth, the gondola is geared to flip opposite, and at twice the rate, of the main boom. 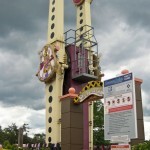 The structure is similar to A.R.M’s Ali Baba but with a different gear ratio to the gondola attachment, creating a completely different ride. Inverter’s arm turns up to 8 RPM using 2 460 volt DC variable speed motors. While the ride has lots of midway appeal; and is a stunning ride to watch, it has proven a far less remarkable experience to ride. Unfortunately the counter-direction of the gondola decreased the sensation of movement for the rider while the general sensation proved a head-achy yawn to a lot of its thrill-seeking target market. 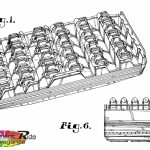 With disappointing earnings for owners, A.R.M USA launched a conversion kit whereby the inverting gondola was replaced with an upright row of seats, that could be angled outwards. Re-branded as ‘Full Tilt’ it has proven considerably more popular. Alternatively Inverter can be retrofitted with a standard Ali Baba gondola. Approximately 20 single-arm Inverters were manufactured and 2 permanent double-armed till production was discontinued in 2001. The number of unconverted Inverters currently operating is unknown, with the vast majority found in North American parks and carnivals. Sounds like an okay ride, especially the newer models. This ride had just been launched when I first visited America and people were very excited about it at the time. Unfortunately I’m yet to ride one myself! Nice review Dave! I don’t think Inverter is that bad myself, however it depends on where you sit. The middlemost seats have barely any forces, but the outermost ones provide a cool slingshot type of motion that are really enjoyable. The harness design isn’t too great though as it digs into your thighs a bit. I ran N.A.M.E,s allstar devision inverter for 3 years its a great ride but the incoder on the bottom of the drive moter is very suseptable to moister and is suggested needs to be taken off before transporting down the road. because the ride is DC driven if the incoder lies to the drive cumputer and tells it its going slower than it really is the cumputer compansats and she will fly a whole lot faster than it was ever ment to.so when you cut the main power to the ride ther is know power coming in but because of DC she will keep flying until it disapates.makes for an exciting ride for the opperater. Hi, I am going to Las Vegas in April for My Grandmas birthday and The Adventuredome has this ride its called The Inverter. I have never been on one before and this is my first time going on. Too bad Clementon Park and moreys piers sold their Inverter and Blue Diamond Park closed. I went on the ride expecting it to be fun. It was kind of a disappointment. The thrill really isn’t that great. It crushes your legs and just hangs you upside down most of the time. The seats are tight and too close together — cramped. Our company owned one for three years, and it spent most of it’s time as a colorful light fixture than a ride. AT ALTON TOWERS THERE IS 1 LIKE THE INVATER. ITS CALLED THE SUBMISSION AND IT IS DOUBLE!!!! These rides they had to stop making they had a massive recall on alot of these things because the locking clip that controlled the flipping movement malfunctioned crushing people at the bottom and killing others. 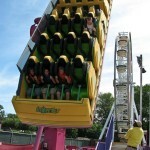 I want o buy a ride like the Inverter ride. If You sold it please tell me. And i want to know price and location. And how is the ride, about the operación condition. I’m from México. Thanks for the info. I think that hurricane ike was why they sold it at kemah boardwalk cuz it broke 4 times!!!!!!! My friend rode it and his cousin, Terry, was screamin’ so loud when they were on board!!!! It sounds like this is nearly an extinct ride. They seemed to be very complicated to maintain, very contrary to what most operators want, let alone customers. I know there is still one operating at Adventureland in Iowa. Not sure if any others still exist??? hi, this ride does not exist anymore. 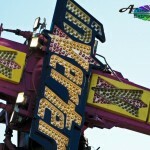 The Inverter was replaced at the South Florida Fair in 2014 by the A.R.M. Rock Star. In fact, most all Inverters have been replaced by an A.R.M. Ali Baba-style Ride. Iowa’s Adventureland still has the Inverter, but it’s rumored to be going away. Interesting about the conversion to Full Tilt. That might be an interesting option for the park if they didn’t already have Falling Star. I like the Inverter ride that I went on. I rode that ride four times, more than any other ride. I miss that ride, it was my favorite ride. They ought to improve it better and remake it again. 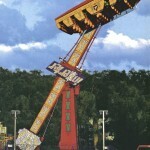 shame this ride doesn’t exist anymore. 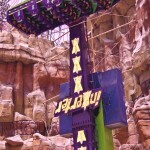 This ride still exists, there is an Inverter at the “Adventuredome”, an indoor themepark in Las Vegas.